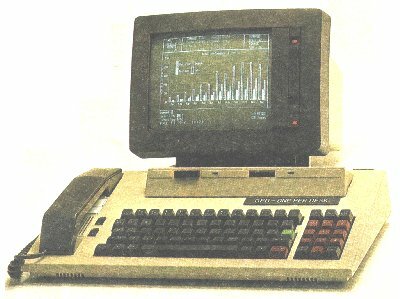 These machines, based upon the Sinclair QL, but heavily modified for business use by ICL. Were launched in November of 1984. At last a simple desktop tool for the busy manager, or even for access to the company mainframe. 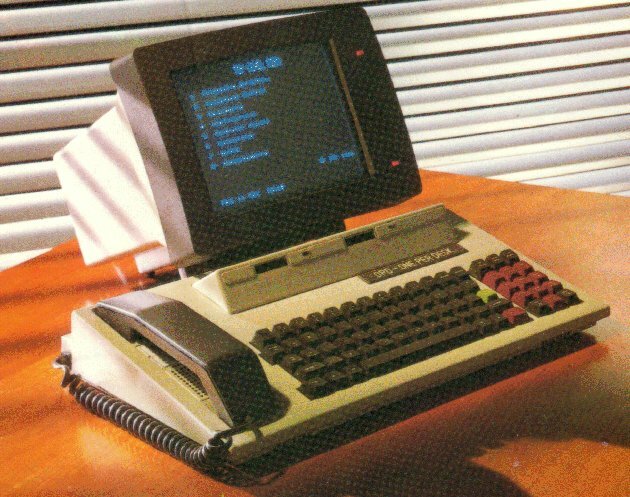 I used one of these for years both in the office and from home, using it to access the company support system, and even undertook some remote diagnostics, on 3900 systems, via the central support system. It worked well, was reliable, even if it was not too fast. The microdrives, were debatable, but when I was presented with a pair of disk drives. The machine showed what it was made of. Performance increased on saving and loading as well as access to databases. The integral packages were Quill for Word processing, Archive for Databases, Abacus was the spreadsheet and Easel for Graphic display of results. Added to this list was a phone dialer and task switcher / scheduler which allowed the machine to make simple backups of the phone book, overnight.The telephone answering facility, gave a lot of scope to answer the phone when you were not around, and had a tight set of spoken responses, which were selected from a menu of words. The theory was that you could not get the machine to say anything which was offensive or rude, however people took the selection of words as a challenge and some of the results were both offensive and rude in the extreme. The Basic was tailored to the OPD and was loaded from microgroove ( very slowly ) or almost instantaneously from Disc. Somehow the word got around as these were scrapped, and it was not unknown for engineers to ring me up and say they had found a screen or part of a base unit, being thrown away by customers, did I want one ? Yes was almost always the answer, so thanks to all those who climbed into skips, raided customers scrap heaps and contributed parts to keep my favorite desktop tool going, with disc drives and a colour screen these machines exceeded, the original specification, in both useability and performance. There is some support to keep these very collectable machines going, see here for Microdrive repair tips.